A firm uptrend continued to mark the late sessions in the markets; the Sensex gained 623 points at 18,446, while the Nifty surged 189 points at 5,522. After a strong opening this morning, following a fairly satisfactory Budget on Monday, and positive response from industry, the bourses clocked in gains, with the auto index leading the gains, mostly. The Budget proved a relief rally for most investors, as the government doled out proposals to counter rising inflation, and further economic growth. 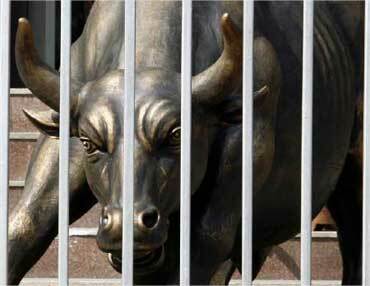 Image: A sculpture of a bull is seen through the gates of Bombay Stock Exchange. For the next fiscal, the government increased the IT exemption limit for individuals from Rs 160,000 to Rs 180,000. Top gainers on the Sensex were auto major Mahindra & Mahindra at Rs 660 up up by a whopping 7 per cent, followed by Maruti Suzuki at Rs 1,278 up 6 per cent and Hindalco Industries at Rs 211 up 5 per cent. 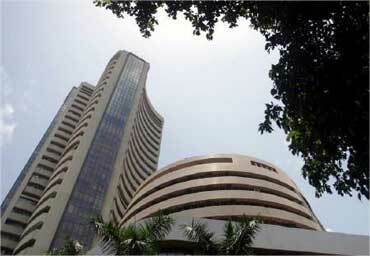 Tata Power was the only loser on the Sensex, down a little less than a per cent at Rs 1,147. 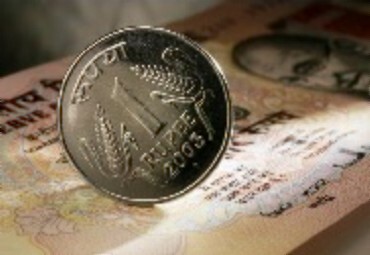 Small-cap was at 7,960 up 2 per cent. Among the sectoral indices, the Auto index held ground for most part of the day today, after last week's dismal performance amidst fears of a hike in excise duty. However, with the government keeping the excise duty intact, auto stocks rallied, and the index was seen trading at a premium of 5 per cent at 8,666. Major gainers in this space were Asok Leyland at Rs 51, which leaped 10 per cent, Bharat Forge at Rs 332 and M&M at Rs 663 both up 8 per cent. Apollo Tyres and Maruti Suzuki were other gainers up 6 per cent each.